Well, I’m disappointed to be sure, and I guess not all that surprised that my favorite online backup service CrashPlan is discontinuing their Unlimited Backup Service for consumers. I always felt it was too good to be true and apparently the people at CrashPlan agree. As of August 22nd, they are no longer allowing new home service clients or existing customers to renew their plans. Existing customers have until (up to) October 22, 2018, to either upgrade to a more expensive plan or find a new online storage solution. I’ve been using and recommending their service to my clients for years. I think most people that use this type of service were in agreement that they offered the best combinations of features and cost. So now the search begins for alternatives. You can migrate to the business tier now at a 75% discount for the year and then it will be at $10 a month until they no longer want your business and they raise the rates. Sour grapes sarcasm intended. You can migrate up to 5TB to the new tier. CrashPlan chose Carbonite as their choice for their home clients, which (sour grapes again) means I am pre-disposed to change to this plan. They are offering a 50% discount for the first year. The services are not equal in several important ways. CrashPlan included external drives in their $60 plan; Carbonite does not. You have to pay $100 a year (basically the same as the CrashPlan Small Business) to backup your external drives. Encryption and versioning are not as good, and the reviews of Carbonite for Mac are less than flattering. Backblaze was the company that I was considering when I eventually chose CrashPlan. They are the closest alternative to CrashPlan regarding cost and services provided. The biggest difference is that with CrashPlan my old and changed files were kept forever and not the 30 day limit with Backblaze. With years of experience of cloud storage, this is probably no big deal because I have not had to use that feature. These online cloud storage should never be your only form of backup protection as this sad day profoundly confirms. Third party protection of your valuable data should be your backups back up! Using the cloud has always been my third line of defense for protecting my files. I have a robust, redundant system for backing up my work at home. The liability of my backup system is that the data and the backup are all in the house. So if the house burns down so goes all of my data. Having everything offsite in the cloud was my preventive measure for catastrophic failures, like the house exploding or the zombie apocalypse! 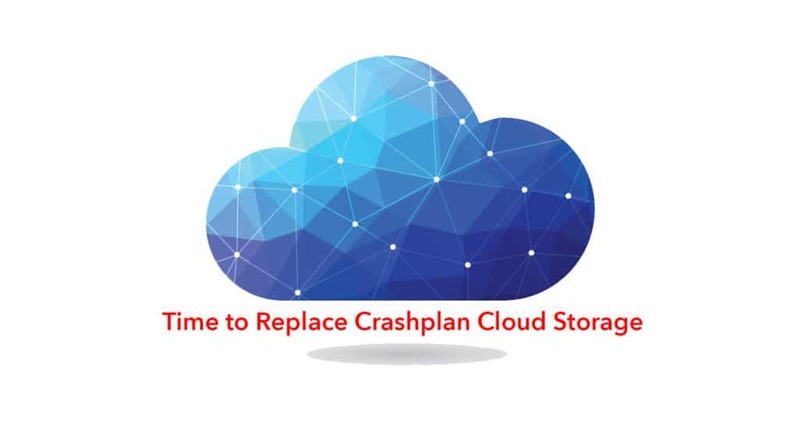 I still have over a year of backup with my former friends at CrashPlan, and I will take a couple of weeks to see if anybody else steps up with a killer deal to seduce me into another cloud storage relationship. Give yourself time to make the transfer. I have fast internet that uploads at about 13mbs. At that transfer speed, it will take 35 days of non-stop 24/7 uploading to transfer 5TB of files. In the real world, that is likely going to be closer to 50 days because you will not be able to maintain that speed 24/7 and your ISP may also throttle your speed with that much data transfer. Are you using CrashPlan? What are you going to do?